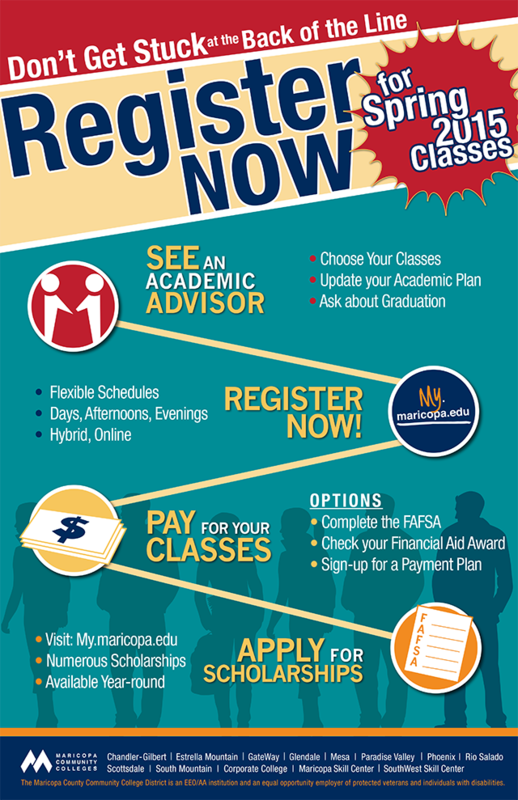 Take advantage of the benefits of registering early--and the student services available to you through Rio Salado's Academic Advisement and Counseling Services teams. We also recommend you enroll in Rio Salado's College and Career Success Classes, which are designed to help you succeed in your educational career and personal growth-- especially CPD 150, which is also available online. With CPD 150, you'll learn about college support resources, how to develop an educational plan, time-management strategies, goal-setting strategies, effective communication skills and note-taking, strategies to improve memory, test-taking tips, career planning resources and more. I am very pleasantly surprised at how much I enjoyed taking this class. I wish there was a way to tell everyone attending Rio Salado the importance of taking this class. I just wanted to say thank you, for everything! This class has been an amazing guide and I have recommended it to my brother and best friend who are both undecided. I have learned many valuable time-management skills that have resulted in working smarter rather than harder. I have also learned that no matter how “mature” and “wise” you think you are, you can develop new skills that will result in new experiences. I have developed new skills that are making my classes more enjoyable.